Have you ever liked the idea of hosting on your own server but been worried about setting it all up? Or perhaps you’ve found that being on a shared hosting solution just doesn’t meet the demands needed to keep your website running smoothly? If your high-performing website has outgrown the resources that shared hosting has to offer but you don’t want the headache of managing your own server, a powerful and flexible alternative is an Elastic Site. With Elastic Sites, you choose the resources you need – like CPU, RAM, or connections – to ensure optimum site performance, and you can easily adjust those resources as you grow. Elastic Sites ensure that you get all the resources available from the server, but in an isolated shared environment that is easy to manage, much like a shared hosting account. If this sounds what you’re looking for then now’s the time to take advantage of this fantastic offer, save 50% on your first month’s Elastic Website Hosting. Netcetera has been providing hosted solutions for over 20 years and we’ve learnt a lot about hosting websites during this time, including an understanding of the pros and cons of the different types of hosting available. We know that the introduction of the Elastic Site is the logical step up from Shared Hosting without the price tag normally associated with having your own server. 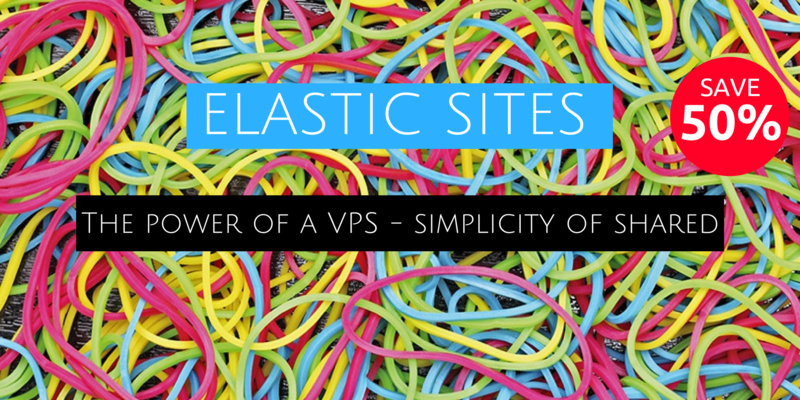 You can now combine the ease of hassle free managed hosting with the elasticity and power of a VPS. Welcome the Elastic Site. Netcetera’s latest hosting innovation has been designed to give you the best of both worlds when it comes to hosting your website. Our exciting new Elastic Sites give you total control over your server and will allow your clients to have a faster more pleasurable end user experience when they engage with you through your website. With prices starting from as little as £9.99/pm this truly offers the low cost associated with shared hosting but with the power and security normally associated with having your own. There has never been a better time to switch your hosting to Netcetera so why not join the thousands of clients who have already switched and see for yourself the benefits of being with one of the fastest most reliable innovative hosting providers on the planet. To take advantage of this great money saving offer simply choose the Elastic Site you require and use PROMO ELASTIC50 at the check-out to save 50%.